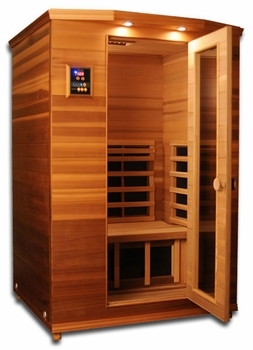 Two person cedar infrared sauna comes with dual digital controllers, mood light and ceramic/carbon fiber heaters. Our two person infrared saunas are one of the most popular models and made from highest quality western red Canadian cedar wood and advanced heater made with a combination of carbon and ceramic elements. They are perfect for limited space. Double wall tongue & groove Construction with no Veneers. AM/FM/CD player and dual digital controllers. Window for light and ventilation.